The External MIDI option can be found in the upper left MIDI input box on Software Instrument tracks. The way that Logic handles external MIDI instruments such as hardware synths and drum machines has changed over time, and some people now find the method less than totally obvious. It is actually easy enough if all you have is a single mono- or multitimbral synth: create a new track, select Software Instrument as the track type and then choose External MIDI in the upper‑left MIDI input box. 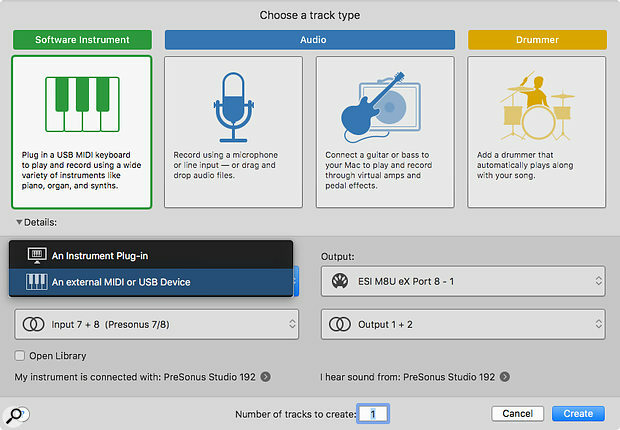 In the box directly below the track type, select the audio interface input(s), mono or stereo, to which your synth is physically connected — 'Presonus 7‑8', in the screen shown above. In the Output section select the MIDI port connected to your synth, select the MIDI channel and, in the box below, set the audio output to the main stereo output (1‑2), or to wherever else you wish to route the audio from the synth. If you need more than one synth track, as would be the case for a multitimbral instrument, just enter the number in the field at the bottom of the New Track screen and you'll get multiple tracks, all set to consecutive MIDI channels. The track that you get looks just like a software instrument track but you'll see an External plug-in inserted instead of an instrument. Open the External plug-in and you'll see that the settings you entered when creating the track are all in place. Hit Record in Logic and you can record MIDI just as you would with a software instrument, but now your external synth is providing the sounds. At this point, patch selection can be handled by inserting Bank Select and Program Change messages in the Event List, or you can choose to set these directly on the external synth using its own front‑panel controls.